MILWAUKEE (AP) Giannis Antetokounmpo is playing ”at a crazy level,” according to teammate Khris Middleton. 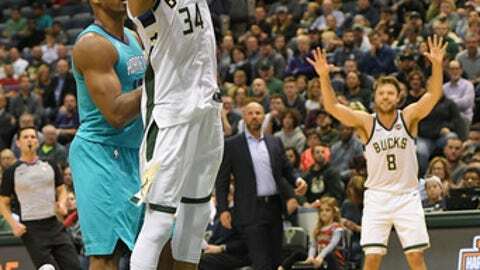 Antetokounmpo had 32 points and 14 rebounds, and the Milwaukee Bucks scored the final nine points in a 103-94 victory over the Charlotte Hornets on Monday night. The reigning Eastern Conference player of the week was 13 for 21 from the field and 6 for 8 at the line. He also had six assists and blocked two shots. The 22-year-old Antetokounmpo has scored at least 30 points in each of his first four games. He had a career-high 44 points Saturday against Portland. Middleton added 20 points for Milwaukee, which played its third game in four days, all at home. Charlotte, which missed its last seven shots after the score was tied at 94, was led by Frank Kaminsky’s 18 points. Jeremy Lamb added 17 points, Kemba Walker had 15 and Dwight Howard grabbed 22 rebounds – three shy of the team record. Antetokounmpo’s two free throws gave Milwaukee a 96-94 lead with 1:34 left. Charlotte missed two 3-pointers on its next possession and Middleton made a 3 from the top of the arc with 43.5 seconds to go. Howard missed two foul shots with 33 seconds remaining to finish 0 for 9 from the line, but Charlotte caught a break when the rebound was tapped to Lamb. But he missed a shot after driving through the lane. Antetokounmpo sank two more free throws, Walker shot an air ball from long range and Middleton capped the scoring with two free throws with 16.2 seconds left. A floating shot by Middleton gave Milwaukee a 90-81 lead with 7:49 left. But Charlotte responded by scoring the next seven points, and shortly after tied the score at 94 on a 3-pointer by Kaminsky with 3:05 remaining. But the Hornets were shut out from there. Antetokounmpo’s 147 points through the first four games are the most in team history. Kareem Abdul-Jabbar had 146 in 1970-71. Charlotte announced before the game that guard Julyan Stone will miss four to six weeks with a strained left hamstring. He got hurt in practice Sunday. Bucks guard Malcolm Brogdon also did not play because of a left ankle sprain. It is uncertain how long he will be out. Hornets: Howard became the first Hornets player with three straight 15-plus rebound games since Al Jefferson in 2014. Bucks: Milwaukee attempted just three free throws in the first half, compared to 22 for Charlotte. Hornets: Charlotte hosts Denver on Wednesday to begin a three-game homestand. Bucks: Milwaukee hosts the Celtics after opening their season with a win in Boston.